Yongkang Homeshine Silicone Products Co.,Ltd. Add:YangLong Industry Zone,ShiZhu Town,Yongkang City,Zhejiang Province,China. 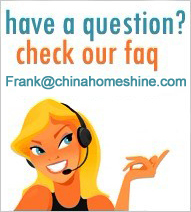 "Reliable quality,competitive price,excellent service and support" from Homeshine! There is an old Chinese saying that:"The success comes from working with right people in right time at right place". ●Have already passed the strict quality inspection of ISO9001:2000 quality management system and our products quality meets worldwide standards including FDA of USA and LFGB of Germany. ●Worldwide distribution network Our partners from North America,South America,Europe and Southeast Asia, etc. ●Quick after-sale technical advice and guidance .